When Honda launched Acura in 1986, it wanted to offer North American drivers a more high-end alternative. Back then, buyers in our market didn’t think of the Japanese manufacturer as a maker of luxury products, so it made sense to create a separate division. Acura initially selected models from Honda Japan’s long line-up of products and simply stuck its logo to the front grille. The new division’s first picks were the Legend, a luxury sedan, and the Integra, an agile, sport coupe with a hint of luxury to it. The brand was an instant hit. So much so that its success prompted other Japanese manufacturers to follow suit, and it wasn’t long before Lexus and Infiniti were created. Today, Acura distinguishes itself further from the common man’s Honda by developing vehicles that feature their own style and architecture. In terms of appearance, they look nothing like the cars built for the mother brand, but Acura is still hanging on to an old vestige from the days when all they did was grab a Civic and slap a new exterior and Acura emblem on it. And that vestige is the same old ILX they’ve been selling since 2012. 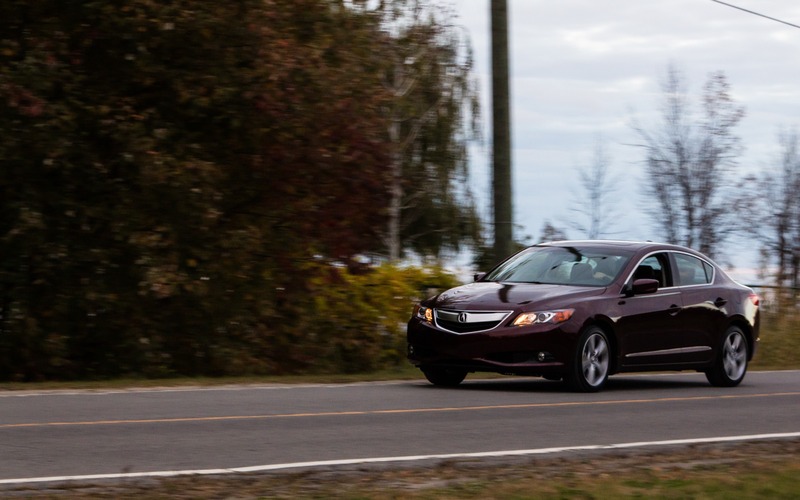 Unfortunately, the 2015 ILX doesn’t have much to set it apart from the fierce competition. Given that it’s unable to seduce buyers, Acura’s decided to give it a complete overhaul for 2016. Its standard engine is a wheezy 2.0-litre that struggles to cough up 150 horsepower and fails to deliver the level of refinement you’d expect in a luxury vehicle. The same can be said for its outmoded interior and handling, which lacks refinement despite the fact that it’s direct and precise. But if there’s one thing that changes everything for the ILX, it’s the Dynamic version. One thing you’ll notice about the Acura ILX Dynamic is that it comes with a 10-speaker sound system and a navigation system. But if those were the only differences, you’d wonder why it costs $32,290, fully $4,100 more than the base trim. There’s a mighty big difference under the hood: the Dynamic replaces the original 2.0-litre engine with the 2.4-litre mill from the Honda Civic Si. Delivering 201 horsepower and 170 lbs.-ft. of torque, it’s paired with a manual transmission featuring six short speeds, also taken from Honda’s sportiest vehicle. This engine makes all the difference as it dramatically transforms the driver experience. We’re willing to overlook the outdated interior now that our attention is absorbed by the rev counter that’s steadily climbing to 7,000 rpm and beyond. When it passes the 5,500 rpm mark, the i-VTEC system activates. Without going into the technical details, this system electronically regulates fuel injection and air intake to generate more power when revs are high, without sacrificing fuel economy. The i-VTEC doesn’t kick in as abruptly as previous mechanical VTEC systems, but it boosts power and creates that unique sound that only Honda engines make. To enhance the driving experience for this version of the ILX, Acura didn’t bother with the automatic transmission. The manual is fun to use, as the weight of the gear selector is well calibrated and the shifting distance is kept short; experienced drivers will be able to shift quickly. Last but not least, the ILX Dynamic’s steering has been fine-tuned compared to the Civic’s. It’s more communicative and, despite the power assist, it provides plenty of feedback. Not only is the ILX Dynamic the only 2015 Acura with a sporty soul, it’s also about to go down in history as the last Acura with a manual gearbox, and chances are slim that the manufacturer will revive the clutch in a future model. At the end of the day, the ILX Dynamic still has some drawbacks. There’s too much wind noise when driving at highway speeds, the suspension could be sportier and the uncomfortable rear bench only folds down in a single piece. And yet, when I had to return the keys for the ILX Dynamic, I found myself turning back and giving a long, wistful look at the last Acura to represent the manufacturer’s original philosophy. Will the new ILX be more competitive? Definitely. But if anyone asks me which Acura I most enjoyed driving recently, I’ll immediately remember the nights spent driving down winding roads with the sound of a four-cylinder Honda engine in my ears as I toyed with the fantastic manual gearbox in the ILX Dynamic. 7/10	If you don’t push it too hard, the 2.4-litre is pretty good on gas. 7/10	The front seats are comfortable and the suspension isn’t overly harsh. 8/10	Some cars may be faster, but accelerating in the ILX Dynamic is a thrill. 5/10	The ILX Dynamic’s infotainment system is getting old and doesn’t live up to its competitors. 9/10	The ILX Dynamic is BY FAR the most exciting Acura to drive. 8/10	Acura is turning an important page in its history book, but we’ll be sad to see the ILX Dynamic go. Acura will use the next international auto show – the North American International Auto Show in Detroit – to show us its all-new Acura Precision Concept. According to the brand’s press release, this car is an indication of the stylistic approach designers will take on Acura’s sedans from now on.